On Sunday we had gone to visit my wife's cousin and his family in Connecticut. While we were there, we had coffee and some home made shortbread cookies. On a previous occasion I had the opportunity to taste almond barfi her cousin's wife Suneeta had prepared and it was very sumptuous. 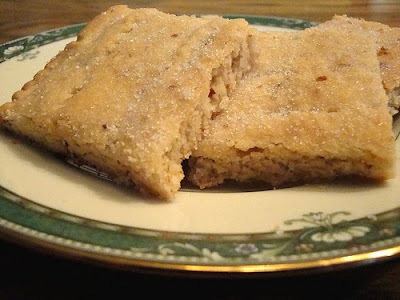 The shortbread cookies are egg-less and really easy to make. Suneeta had also added coarsely ground almonds to the cookies which is optional. I have to say that they were one of the better shortbreads I have eaten, with the right amount of crispiness. Here is the recipe. Preheat oven to 375°F. Blend the butter, sugar, vanilla, and salt in a medium size bowl with a fork until everything combines well. Add the flour and almonds into this mixture and keep mixing with fork or hands until the mixture forms into a soft dough. Transfer the dough to a large baking sheet (ungreased) and pat into a rectangle (1/2 inch thick). Imprint the edges decoratively with a fork and prick the dough all over with the fork. Bake the shortbread in middle of oven until edges are golden, which takes about 15 minutes. Once this is done, sprinkle some sugar on top of the shortbread, and cool the shortbread on the baking sheet on a rack for 10 minutes. Cut the shortbread into the desired number of slices while still warm with a knife. Transfer the slices with a spatula to rack to cool completely. Shortbreads are good to go. Bio on Suneeta: Suneeta lives in Connecticut with her husband and two children. She is very fond of baking, and tries to balance this passion with her work life and family life. Suneeta holds a senior position at an insurance company. She is still not ready for the attention her photograph might generate :-), and hence declined the offer to load her photo here. Ingredient Substitute/s: Avoid the nuts if you have young kids who may be allergic to nuts. If you are fine with nuts, original recipe calls for adding pecans or hazelnuts other than almonds. You can add other extracts other than vanilla, chocolate bits, etc.